This post was originally published on the Community Manager Appreciation Day website. Call me The Accidental Community Manager. A few years ago, I asked my outdoor enthusiast friends if we could get people to post hunting pictures on a website. They seemed to think we could. So I built a website and added some community features to it. For the past five years, I’ve been running and managing the WeHuntSC.com online community. I use Evoq Social, an online community solution provided by my employer, DNN. It’s been a rewarding and challenging experience. At first, I didn’t set out to be a community manager or even run a community site. But before I knew it, hunters from all across the state (and other states) were interacting on the site. Over the past five years, I’ve tweaked the site, added features and tried various strategies to encourage engagement. Along the way, I learned a few tips and tricks about community management that I’d like to share. In sports, there is a saying: “you’re only as good as your last game,” and I think this message is quite relevant to content within online communities. Visitors come to your site looking for new content. If your content is stagnant, then your members may not return. Conversely, if your content is new and recent, then your community members will return more frequently. You’re only as good as your last piece of content. Our site traffic increases during the hunting seasons because any hunting season will bring the freshest content to the site. To encourage members to visit the site during off-seasons, we feature blog series, giveaways and creative competitions to keep members coming back. This requires more planning and work, but consider the downside: a significant drop in activity and traffic. If that happens, members may forget to return when the hunting season resumes. People are visual creatures. We love to see pictures and videos, hence the growth and popularity of Instagram, YouTube, Vine and other media-rich social channels. Outdoorsmen might be more visual than most: hunters love picturesque scenes of nature and big game, and always imagine the scene of a huge trophy buck, a strutting turkey or a flock of wood ducks at sunrise. As outdoorsmen, we see these scenes in our dreams. For this reason, I’ve tried to make our site visual, in order to help hunters identify with these scenes. One trick I use is to load the background image and momentarily delay the rest of the content from loading. This allows members to see and focus on the visually rich, large background images that I use. They can “soak in” that image before the site content loads. I accomplish this by using a simple JQuery “delay” method. I randomly load images, so that each page brings a new background into view. Currently, I have a rotation of twenty background images that show all types of hunting scenes. As users visit a few different pages, they will eventually see the type of game they hunt. When this happens, it strikes an emotional chord with them. This intersection of imagery and the hunter’s visual nature is strategic by design and ultimately increases engagement. Takeaway: Find ways to integrate imagery that’s contextual to the theme and content of your community. I added a “hide content” button on site pages, where users can hide the content on the page, in case they want to focus on the background image. In the future, I plan to work in pictures of our members into the background to reinforce the community aspect of the site. When users see themselves on a large background image, they’ll be enticed to share the link to the site! Try finding the most social users in your community and reward them by featuring them prominently on your site. I guarantee this will drive traffic to your site. I’ve also noticed that any blog post on the site that includes images gets more views. If the blog has an embedded video, it nearly doubles in views. Some of our video-based blog posts receive comments like, “Thanks for posting, I felt like I was there with you.” This is a sign that we made an emotional connection with the reader and it’s also a sign that we’re on the right track. While we’re talking about blog posts, I should mention that a blog series is a great tool to keep your community members engaged with your content. A blog series allows your users to go on a journey with you. Our blog series get far more interactions (e.g. comments) than blog posts that are not part of a series. Whenever we do a blog series, we try to be informative. Also, we strive to emotionally connect with members. We published a blog series on game management and another series on food plots. These series both spanned the course of an entire year and took a lot of time to complete. In both of these blog series, I included images, videos and lessons learned. Blog series, even years after we originally posted, still prove to be useful and engaging. They’re great for “evergreen” articles: content that is perpetually relevant. Blog series can also help your search results and rankings. If you search for “Tecomate Seed Food Plot” in your favorite search engine, you’ll probably see videos from our blog series high in the organic search results. We don’t “keyword stuff,” but if you have several blog entries, accompanying images (with appropriate “alternate tags”) and videos (with compelling titles), then you stand a good chance at getting discovered by search engines. This is a great, low-cost way to increase community membership. Getting community members to blog can be challenging. Some community members want to build their own brand, so providing them with an avenue to do so is an easy win. I’ve configured my site’s gaming mechanics to reward users who write blog posts. For instance, a published blog post gives you 15 points. And those 15 points may move you up a few spots on the leaderboard. Members can enhance their visibility in the community through the leaderboard, which serves as a motivator: some users won’t rest until they’ve reached the top of the board. Not all community members, however, respond to gaming mechanics the same way. One technique I’ve found to be successful is to monitor the site’s activity until a user posts a picture of a trophy animal or publishes an interesting story. When I see this, I proactively reach out and say “that would be a great blog post” and encourage them to email me the story and a picture or two. Once I receive the content, I format it, post it (on behalf of the user) and then share it via social media. Before long, other hunters are commenting and interacting with the post. This makes it really easy for users, because the barrier to entry has drastically dropped. Think about the experience for these users: they are now WeHuntSC.com bloggers! After seeing how easy it was to get published, users will continue to post and share blogs, then learn how to post them on their own. This is a long-term win that happens over time, but it’s definitely a plus for your community. It increases interactions, helps get your users to enhance their reputation within the community, and increases the breadth of contributors in your community. Every community is different and requires attention in unique ways. The tips I’ve outlined might not directly apply to your community, but some of them will. Managing a community is not an easy task and requires constant focus from the part of community managers. I hope this article provided you with tips you can apply to your community right away. 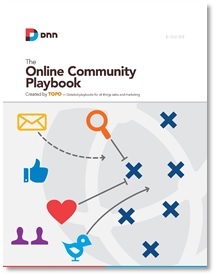 NEXT UP: Check out Part 2 and Part 3 on how to create sustained engagement in online communities.